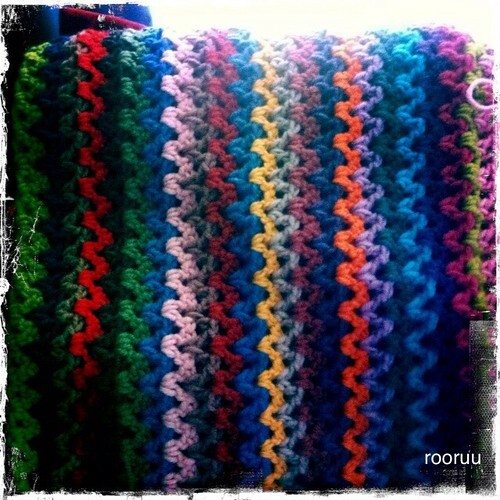 patterning the world: V-stitch crochet blanket. Simple. Using 21 colours of 10-12 ply yarn (mostly Mondial Merino Special) and this very good tutorial to make a crochet blanket in V stitch. It's only trebles and chains, so your hands get a nice rhythm. With a bulkier yarn, this stitch creates an airy, rather than a dense fabric. I *could* just repeat the row sequence three times (one row is 1/3 ball) but that would be predictable. But utterly random is utterly random. So I'm trying half-random for the second set; leaving the odd number colours in the same order, and varying the even number colours. It will either work or it won't. But I'm hoping it will be a happy medium between repetition and variety. Worth trying.